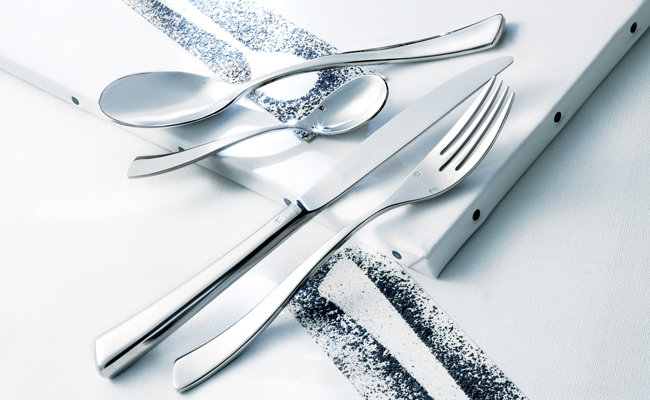 Need catering cutlery, restaurant cutlery or to buy wholesale cutlery online? From traditional restaurant cutlery to more modern styles of catering cutlery. Pattersons Catering Supplies stock everything from wholesale economy cutlery, all the way to 5-star restaurant cutlery in 18/10 stainless steel, our range of restaurant cutlery available to buy on-line includes full canteen pieces from leading catering cutlery brands like C&S, Sola, Grunwerg and Elia. Whatever your catering cutlery requirements are our restaurant wholesale cutlery range has the solution. Economy cutlery is the perfect wholesale cutlery choice for schools, canteens and catering events where the quick, economic, and easy replacing of cutlery is essential. Our canteen cutlery range includes economy table forks, knifes and spoons, as well as economy dessert knives and forks. We even stock cheap teaspoons and soda spoons for hot drinks and dessert service. Everything a budget conscious carere needs is in our economy wholesale catering cutlery range. Parish Catering Cutlery has been a popular choice in the catering trade for years. Our range of Parish cutlery is ideal for restaurants, cafes, and bistros looking to offer formality and class to customer experience, while desiring a restaurant cutlery range that will be able to withstand the daily rigours of catering life. Providing high resistance to stains while maintaining a polished finish, there is no wonder our Parish catering cutlery has been a best seller for years! For everyday catering cutlery with a modern twist and for those looking for something a bit different than parish catering cutlery then why not see what fantastic ranges of modern restaurant cutlery we stock. Suitable for mid-range restaurants, hotels and bistros, our modern range of restaurant cutlery includes 18/0 and 18/10 catering cutlery which is all dishwash safe and designed to be used by professional caterers. Check out the Pattersons Blog on 18/0 vs. 18/10 cutlery to help you chose the right range of wholesale catering cutlery for your needs.